These limited edition Holiday Glitters will be available November 2011 for $7.99 each in the U.S. at HEB, Sears, Stage Stores, select Target locations, Target.com, and ULTA. In Canada, lacquers will be retailed for $10.99 each in Shoppers Drug Mart, Loblaw and Zellers. For more information, visit nicolebyopi.com. Follow Nicole by OPI on Twitter @NicoleByOPI and become a Facebook fan! 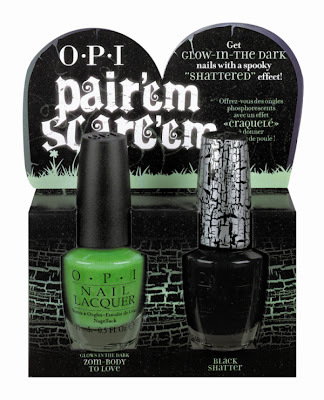 Look Frighteningly Fashionable with OPI! Celebrate the scariest day of the year with OPI’s Halloween-inspired nail lacquers, available in two promotional gifts sets. 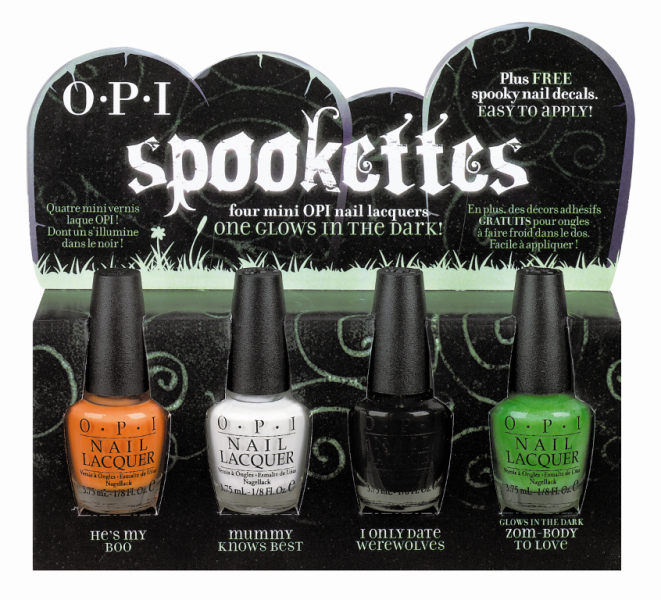 For a limited time only, OPI will offer the new Spook-ettes mini pack, which includes four mini lacquers: He’s My Boo (a scary orange), Mummy Knows Best (a spook-tacular white), I Only Date Werewolves (a bewitching black) and Zom-Body to Love (a glow-in-the-dark green). The Spook-ettes mini pack also includes free nail decals, along with instructions on how to create different nail art designs using the lacquers and stickers. For example, create a two-toned look with “Jack-in-the-Moon,” featuring a grinning face in a white full moon on a black nail, or go bold with “Welcome to Spider’s Corner,” showcasing a creepy-crawler layered over a bright orange hue. Additionally, the Pair’em Scare’em duo pack will bring Zom-Body to Love and OPI’s bestselling Black Shatter together in a hair-raising pair. Inspired by graffiti art, Shatter leaves behind a crackled, two-texture finish when painted over completely dry OPI nail lacquer. Paint Shatter over two coats of Zom-Body to Love and add a top coat for a one-of-a-kind, glow-in-the-dark manicure. OPI products contain no DBP, Toluene, or Formaldehyde, and feature OPI’s exclusive ProWide™ Brush for the ultimate in application. Spook-ettes ($12.50 US, $16.95 CAN) and the Pair’em Scare’em duo pack ($14.95 U.S, $20.95 CAN) will be retailed at Professional Salons, including Beauty Brands, Beauty First, Chatters, Dillard’s, JCPenney, Pure Beauty, Regis, Trade Secret, and ULTA. For more information, please call 800-341-9999 or visit www.opi.com. Follow OPI on Twitter @OPI_PRODUCTS and become a Facebook fan!